Playing chord piano is a useful skill to have, and a very fun way to play the piano. Chord Piano is what we call the style of "comping" or "faking" chords, played either with a melody, or by playing only chords (or harmonies). For beginners, you can simply play the melody in one hand-usually the right hand- and play a selected few 3-note chords or triads in your left hand to "match" with the melody. The technique of chord piano can be as simple as this, up to any possible skill level. Tip: When you start playing chords, make sure to play all chords in root position first. It makes it very easy to play- and anyone can learn this, even without knowing anything about chord playing! Place all your right hand fingers on any white keys next to each other. Finger one on your right hand- the thumb- is on the root (which is why it's called "Root Position"), finger three on the third, and finger five is on the fifth. Play the three notes together- congratulations! You just played a chord! Practice to play chords (triads) like this all over the piano, starting from any white key. Either you play a melody together with chords. Usually this is done by playing the melody in your right hand and the chords in your left. But when you improve your playing you will sometimes let the melody switch hands, and play part of the chord in both hands. The other way is to play only the chords, or the harmonies and either sing the melody, or accompany another instrument who plays the melody. If you just started to learn piano chords, you would keep the chord in your right hand and play the bass note of the chord in your left hand. The great thing about chord playing is that it can be as simple or sophisticated as you want, and have the skills to. But from the very first start it is still going to sound fine! Go to this page with a free piano chords chart and read more about how to play chords and start practicing right now! 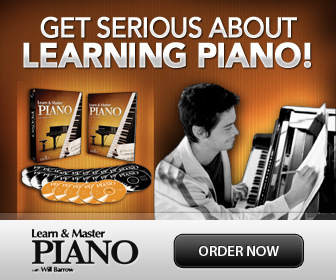 Learn Piano chords An introduction to how to play piano chords. Basic Piano Chords Learn how a chord is built and some common ways chords are written in a score. Easy Piano Chords for Improvisation Learn more about the primary chords and how to use them in improvisation. This chord piano lesson continues here with more about chords and how you can "turn them around" for smoother transitions! Learn how to play all major and minor chords, and their inversions! You can also print out free Piano Chords Inversions Charts (PDF). Learn ways to combine chords to create well known accompaniment styles, or use the chord progressions as foundations for improvisation. Fun! Roman Numerals Chords Another pesky way to write chords? It's easy actually. And rather useful. For your convenience, you can print out this free chart (PDF) for easy reference of the most common piano chords in "root" position. Print out (PDF) and place behind the piano keys! An easy way to learn the note names on the keys and some basic chords.